A US ship has fired on a boat off the coast of the United Arab Emirates (UAE), US officials say. The USNS Rappahannock fired on a vessel after it ignored warnings and rapidly approached the ship, the US Navy says. There is no confirmation of casualties although a UAE official said an Indian fisherman had been killed and three more wounded. The US has increased its presence in the Gulf after Iran renewed threats to close the strategic Strait of Hormuz. 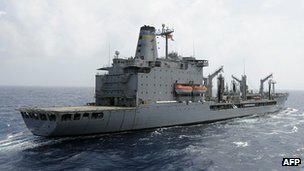 In a statement, the US Navy in Bahrain said that a security team on board the refuelling ship fired on a small motor boat after it disregarded warnings and “rapidly approached” the US ship off the coast of Jebel Ali, near Dubai, UAE.